Footy WAG Nadia Bartel tells: 'I applied spray tan and shaved my legs during labour'. Footy WAG Nadia Bartel tells: ‘I applied spray tan and shaved my legs during labour’. 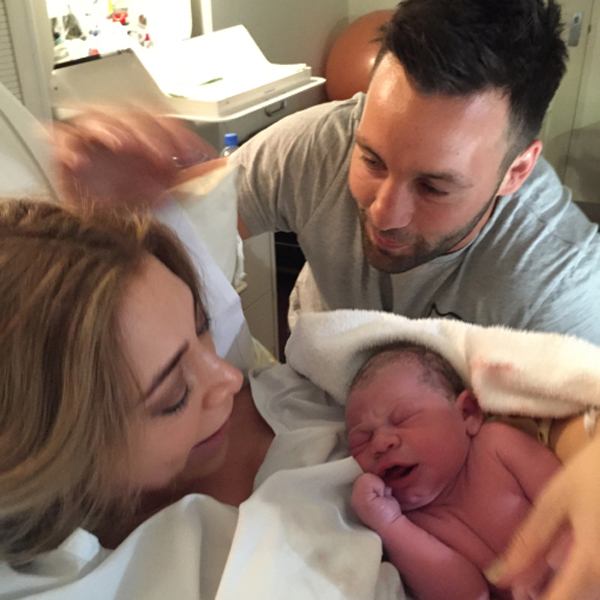 Applying a spray tan and shaving your legs as labour sets in is no mean feat, but Melbourne footy WAG Nadia Bartel has told how she summoned enough energy, concentration and coordination to complete the beauty routine before giving birth. Nadia, the wife of star AFL player Jimmy Bartel – who won admiration and respect when he spoke of his experiences recently as a child growing up with an abusive father – recounted her birth story in all its glory in her blog Chronicles of Nadia last week. The glamour mum blames pregnancy hormones for her determination to wrangle a baby bump and labour pains to complete the last minute grooming session before rushing to hospital to deliver son Aston James. “At 5 am I got up and had a shower, shave my legs and decided to apply some spray tan,” says Nadia, pictured above the day before going into labour. Nadia goes on and candidly explains how grateful she was for pain relief and her pilates classes when the time came to push. “The midwife told me to imagine a concrete wall with a small hole the size of a pea, and I have to push a watermelon out of that pea sized hole. That’s how hard I had to push,” she writes on her blog. She also reveals how it took two-and-a-half-hours to push baby Aston out. “Jim was holding one of my legs up in the air and the midwife was holding the other leg. I was pushing with all my power. “I was sweating profusely and felt like I was going to vomit because of my nausea. I could also feel the contractions, with every contraction I had to push with all my might. In her warts-and-all account, she even reveals how her Brownlow medal winning husband was there to catch her post-birth vomit, after first cutting their son’s umbilical cord. “I just couldn’t stop staring at him in awe; he was this perfect, pink, chubby little boy with a gorgeous little squeal. He then opened his eyes and looked straight into mine, and I will never forget that feeling when he first looked at me. Jim and I were looking at him and couldn’t believe he was ours,” Nadia writes. Nadia, a stylist and beauty blogger, needed 12 weeks of rest following the birth after being diagnosed with pelvic girdle pain, with a form of Symphysis Pubis Dysfunction, but remains euphoric about her son’s arrival. “Aston is so perfect in every way, I am too obsessed with him and every little thing he does,” she says. Nadia’s story highlights how we all approach our impending arrivals differently and no two birth experiences are the same. Take another look at our post on the mum who managed to apply a full face of make-up while in labour.